Before starting my second weekly blog, I want to thank you if you read my previous blog – I appreciate that. Also, some of you have emailed me feedback on the blog which I value and thank you for taking the time to do that. I mentioned the topic of this week’s blog to a few people and they used the word “depressing” to describe it. However, even if suicide is viewed by some people as a depressing topic, I think it is important to raise awareness of suicide and death. It does not have to be depressing for us to talk about this and share our experiences. This week was the week that my friend Justin Broglie died of suicide last year. I met him at the Wisdom 2.0 conference in San Francisco last year. I only knew him for 5 weeks before he died, however he left an impact with me and connected deeply in the short time that I knew him. 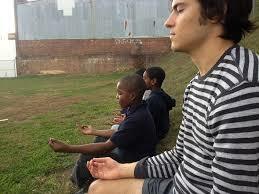 Below is a picture of Justin teaching some local Philadelphia kids how to meditate. We were both actually at the Compassion Research day at Facebook in 2014 during wisdom week, just before the Wisdom 2.0 conference. 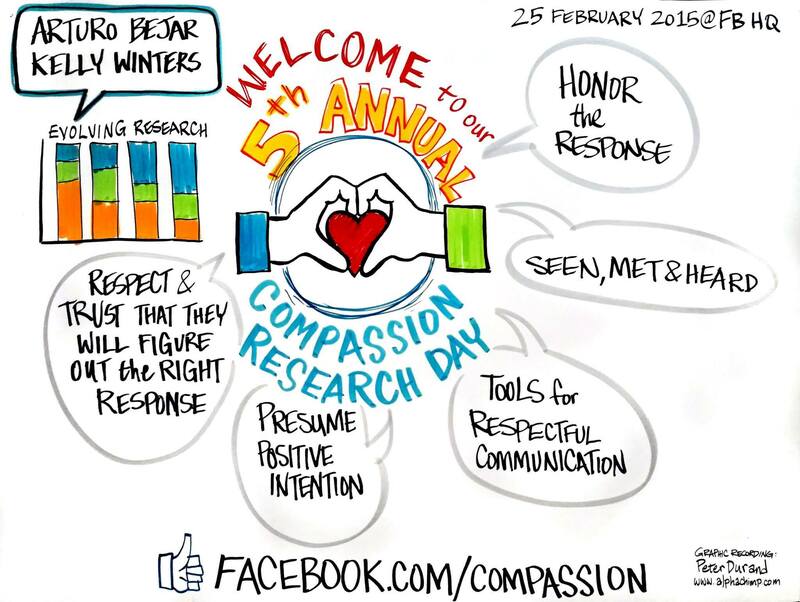 This year it was sad for me when I went to the Compassion Research day at Facebook and he was no longer with us. 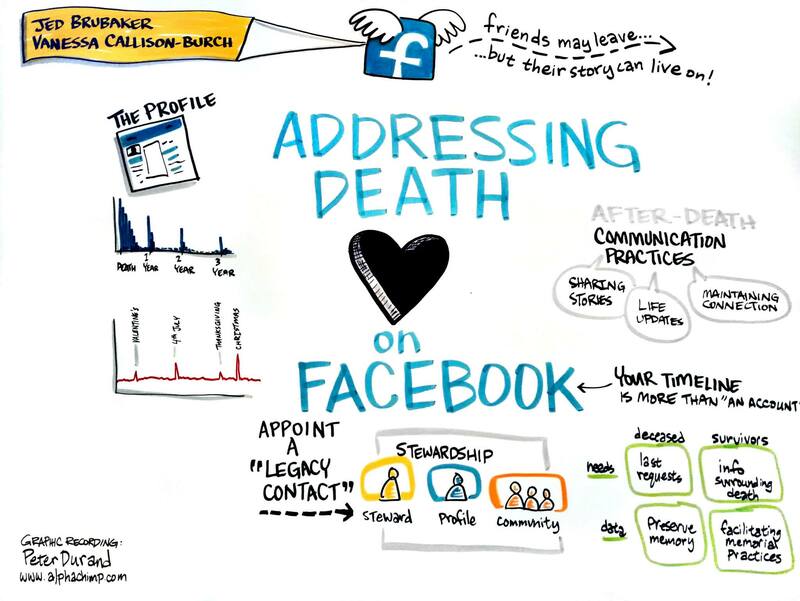 Equally I was sad and pleased with the topic of discussion during the day which was the work that Facebook have been doing on suicide prevention. •Suicide remains the most common cause of death in men under the age of 35 (Five Years On, Department Of Health, 2005). •More than 5700 people in the UK died by suicide in 2010 (Samaritans Information Resource Pack, 2012). •British men are three times as likely as British women to die by suicide (Samaritans Information Resource Pack, 2004). •The suicide rate among people over 65 has fallen by 24% in recent years, but is still high compared to the population overall. (Samaritans Information Resource Pack, 2004). Suicide is something that we as a society are not comfortable with discussing and can bring pain to even bring it up. Death is going to come to all of us. Yet we spend most our lives trying to live longer and avoiding the subject. I have thought that it would make it easier if we learnt about death and how to prepare for it at an early age, even at school, it would be more sensible than the stress encountered of when it happens and not being prepared with how to handle it. Facebook can be seen in lots of ways; a social media giant, a place where you appear to have so many friends yet can feel depressed and alone. I saw another side of Facebook that surprised me, as it is not something most people are aware of. What happens at Facebook behind the scenes that I got to experience two years in a row is the work of the Compassion team at Facebook led by Arturo Bejar. This is where they share their latest research related to helping make technology more compassionate. 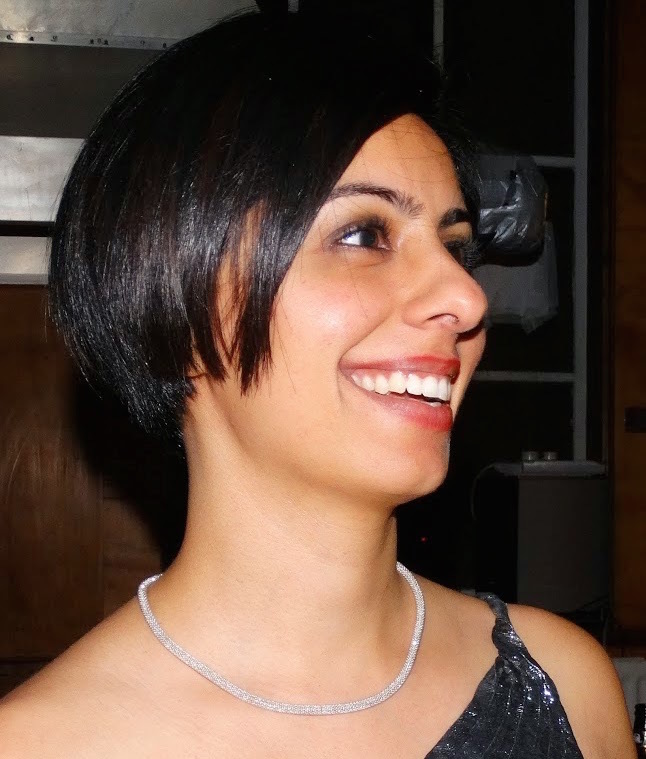 In this blog I will be sharing their work on Suicide and in a future blog I will share the work they are doing with the Greater Good Science Centre. It is pretty shocking that 41,000 deaths in the US are from suicide, more people use guns to kill themselves than breast cancer or homicide. Although from watching the media during my time in the US you would think differently and think that homicides were more prevalent. Suicide is happening although, hidden and not really discussed in the media. I was reassured by the work that Facebook are doing to care for people using Facebook and using it as a platform to connect with others and get help and support. They have three leads across the world covering three time zones that are on alert to help anyone that raises a concern and may need help. Initially they encourage friends to help friends by putting together a suggested email that they can amend and add to or send as it is. They have worked with researchers at the University of Washington, and two organisations that help to prevent suicide called Forefront and Now Matters Now to develop the content and resources available to help people in pain and suffering. The responses link to a number of positive options, including videos from Now Matters Now, an online program started by Forefront research scientist Ursula Whiteside that uses real-life accounts of people who have struggled with suicidal thoughts to provide research-based coping strategies. The two presenters, one from Now Matters Now called Ursula and from Forefront Dr Stuber, were truly courageous and inspirational. They shared very deep and personal stories about suicide and have started the two organisations now partnering with Facebook. When I sometimes ask people what they want to do, myself included, the answer is to help people, but help people do what? These two ladies are helping to destigmatise suicide and show there is a way to help people suffering, by sharing their story, providing information and resources about suicide. 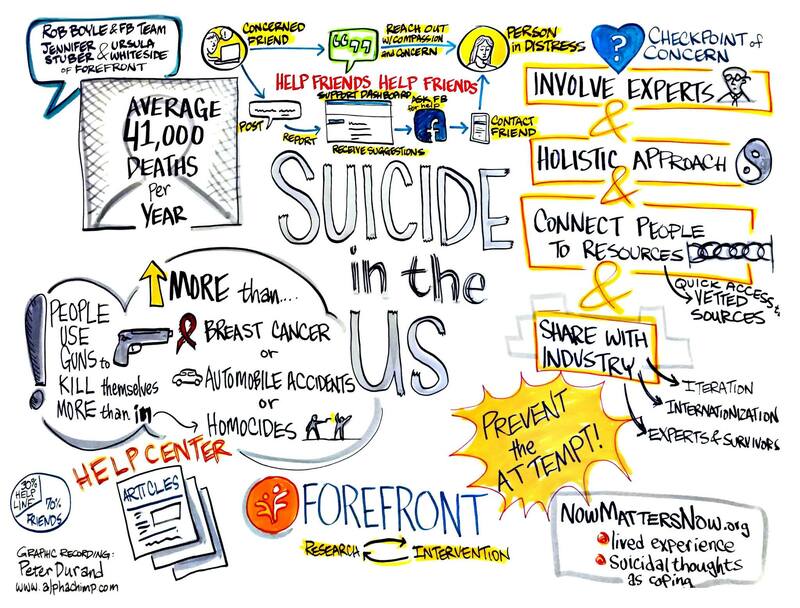 Dr. Stuber from the University of Washington, who lost her husband to suicide in 2011, has conducted research and informed advocacy work to improve Washington States readiness to address the public health problem of suicide. In 2013, she co-founded the UW-affiliated organization Forefront, which focuses on innovations in suicide prevention policy, education, outreach and research. Information is out there, however, I do not think everyone knows about it unless they really need to know. For example, while watching the recent BBC1 programme ‘Life After Suicide’ I became aware of a place in London to help people called ‘Maytree’ a Sanctuary for the Suicidal. They provide people in the midst of a suicidal crisis with the opportunity for rest and reflection, and give them the opportunity to stay in a calm, safe and relaxed environment. They can support four “guests” at a time. The service runs 24 hours a day, 365 days a year. The volunteers and staff team spend up to 77 hours with each guest over their stay, giving them the opportunity to talk through their fears, thoughts and troubles. On leaving, each guest receives a goodbye letter. This is a personal record written by a member of Maytree’s staff team which reflects their stay, validates their struggles and honours their achievements. Maybe we need more places like this in the UK and the rest of the world. Once I laid asleep and woke, To beauty all around, Sun rays, softness, warmth and peace, A couch, a room, a window I’d found. 13 years of age, A transforming stage, Looking out on the world around, And as I did, it bit by bit, Came crashing,tumbling down. Sun rays darkened to thoughts I’d left, behind before I slept, Softness hardened to thoughts I’d had, of passed and so inside I wept, Warmth turned cold to thoughts I’d need, for future plans iI’d kept, And peace oh peace, such sweet release turned to hatred and contempt. Let me sleep some more I thought, 13 but lives so old, Its hard to bare the load out there, When so much beauties sold. To thoughts of goals and dos and don’t, To thoughts of then and when, To thoughts of making sense, Of senseless everything. But this tangled mess of thoughts to digest, Will always be out there, So I awoke, but kept a piece of peace, To a world less hard to bare. Facebook has 1.393 billion monthly active users (Craig Smith, 28/1/15) spending an average of 21 minutes a day. Whatever we may think of this growth in social media – be it good for us or bad for us, or both good and bad –and using it in this way to help people when they are suffering most and feeling alone to feel they are not alone, and letting them know that help is available is definitely great work by Facebook – so gratitude and compassion to the team at Facebook working on this for us all. To close this week’s blog, a lesson I learnt from meeting Justin is the importance of how we engage with others when we meet them: are we present, are we listening to them? We will never have the chance to have the same interaction again. Remember a kind word, a gentle smile, listening with your heart can make your day and someone else’s a day to remember.